Returns the regular expression for valid input. This validator checks whether user input matches the given regular expression. It checks the complete input; prefix ^ and suffix $ are not needed. This validator does not fully support unicode: it matches on the CharEncoding::UTF8-encoded representation of the string. Sets a new regular expression validator that accepts input that matches the given regular expression. 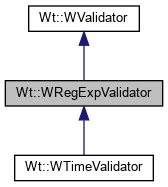 This constructs a validator that matches the regular expression expr. Returns the message displayed when the input does not match. Returns the ECMAScript regular expression. Sets the message to display when the input does not match. The default value is "Invalid input". Sets the regular expression for valid input. Sets the ECMAscript regular expression expr. The input is considered valid only when it is blank for a non-mandatory field, or matches the regular expression.